Amritsar lies at the crossroads of historic past and magnificent present. The city has traveled through the bravery of Maharaja Ranjit Singh to the wrath of India's partition. Today, Amritsar is a land of valor and divine. It encompasses the very north Indian spirit of flavors, festivals, and fashion. It's a place of kulcha and gigantic lassi for a foodie. 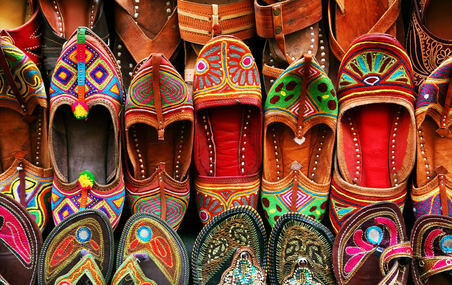 For a shopper, its the place of phulkari and hand-crafted jutis (ballets). For a believer, it's a place of divinity and one of the most sacred pilgrimages of Sikhs. It is also a place to reminisce the stories of Sikh sacrifices and touch the scars of partition. 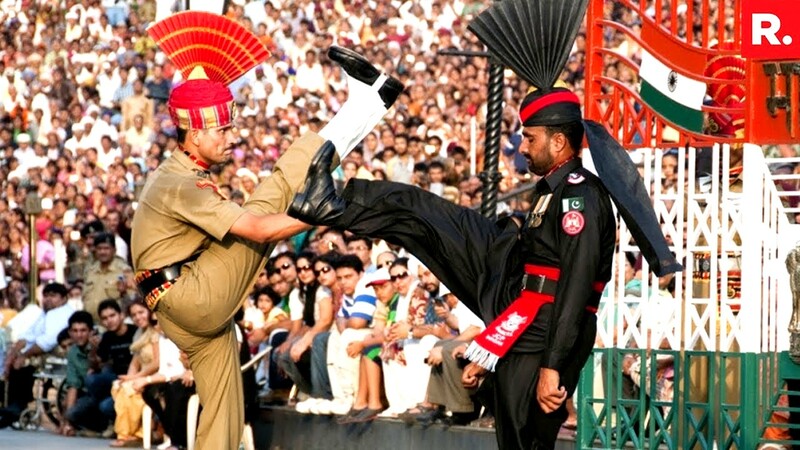 For a patriot, it's the place to experience gallantry of our armed forces at the Wagah border. We visited Amritsar during the month of May. I know, you are thinking that's hot! Well, how could we go to Mcleodganj and not visit Amritsar? But we planned in such a way, that sun wasn’t a deterrent in exploring the holy city of Punjab.We prefer researching the place before going, so we turned to online resources like websites or blogs. But the true gem of information came from our friends who had lived in Amritsar. They told us all that we needed to know to experience Amritsar like a true-blue Amritsariya. So if you are planning to visit Amritsar, you are at the right blog. If you haven’t been to Amritsar, I suggest you soon start planning after reading this post. There are some travel planning tips at the end of the blog too. Refer to them before you book your hotels or flights. We reached Amritsar around noon time, on our way back from Mcleodganj. Since the sun was shining brightly on our heads, we headed straight to our hotel. After shedding tiredness of our 6 hrs bus ride, we stepped out for lunch at the very popular Kesar Da Dhaba. As they say in Hindi, ‘Pehle paet puja, fir kaam duja’ which means service of the stomach comes first (really loose translation as some phrases of hindi can only be felt, there is no translation for them). If dhaba resonates to you an open shack style and not so hygienic place, think again. Kesar Da Dhaba maintains its rustic charm while being fully air-conditioned. The interiors are clean and minimalistic with white marble tables and wooden benches. Attached to the restaurant is an old style kitchen with an open counter for takeaway. We made ourselves comfortable and ordered their signature thali. Whether you are a foodie or not, you have to visit Kesar Da Dhaba at least once for the very Punjabi food experience. Now bookmark it in your travel list. Quick! Quick!This single thali can easily fill the two of you with Punjabi dal makhani, chole curry, yogurt, homemade pickle and very crunchy set of two huge paranthas. Also, leave your mental calorie meter at home, as the dal makhni doesn't swim in oil, it drowns. Accompanying the thali was a generous dose of the raw onions. It's a must have to keep your stomach cool and steady for gorging all the food that’s coming right onto you. As we sat down to eat our humongous meal, huge glasses were being frequently passed around the room. As any Indian would instantly recognize it was one of the North Indian staple drinks and trademark of the state of Punjab, Lassi. How could we not order it? Ultimately, we left the dhaba, feeling utterly-butterly happy. Since the sun was still intense, we decided to visit Darbar Sahib or as it's globally known, the golden temple in evening. Our hotel was close to the temple, so we decided to walk. However, if you are not the walking type, there are plenty of e-rickshaws to ferry you there. Yay! Say yes to environment-friendly options! We first stopped at Jallianwala Bagh. It is situated next to golden temple at the periphery of newly renovated Katra Ahluwalia area. That’s one area you should star mark on google maps. Most of the attractions are located in its vicinity. 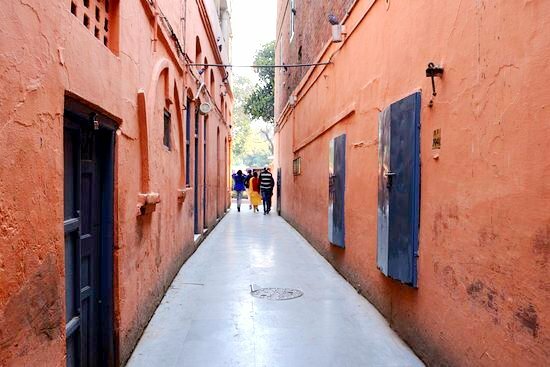 A narrow lane leads to Jallianwala Bagh. Running my fingers on the walls of the lane, I could almost visualize General Dyer and his troops entering this very lane, trapping and massacring hundreds of innocent people. Jallianwala Bagh massacre went down in the history as one of the most brutal attacks British Raj inflicted on the people of India. Walking through the garden, you can see well-preserved bullet marks, the water well where people jumped in, trying to save themselves and similar other reminders of that ghastly incident. At that time, the only thing that was going on in my mind was that how lucky we are to live and breathe in free India. And how less we acknowledge the sacrifices of our martyrs. We live in a time where Independence Day is mostly reduced to a holiday and compatriots whine about standing up for the national anthem. Could we have survived ‘Dogs and Indians not allowed’? If all this history and patriotism talk bores you, just go there to say a silent thanks to our ancestors. Because, trust me, our generation of social media warriors cannot even survive the meaning of freedom struggle, let alone the sacrifice it demands. Outside Jallianwala Bagh, the scene quickly shifted from somber to celebratory. We walked past eager shoppers, hackling vendors and rows of shops selling everything from clothes, jewelry, ballets to street food. The whole area has been redeveloped with wider roads, similar architecture and pedestrian zones. It was like being in a different part of the world, amidst the everlasting festivities. Kudos to the previous state government for a job well done. But frankly rest of the city with its bad and broken roads, still needs to join the development bandwagon. You know you have entered the Harmandir Sahib complex when everything starts to look extremely clean, well-managed and pristine white. 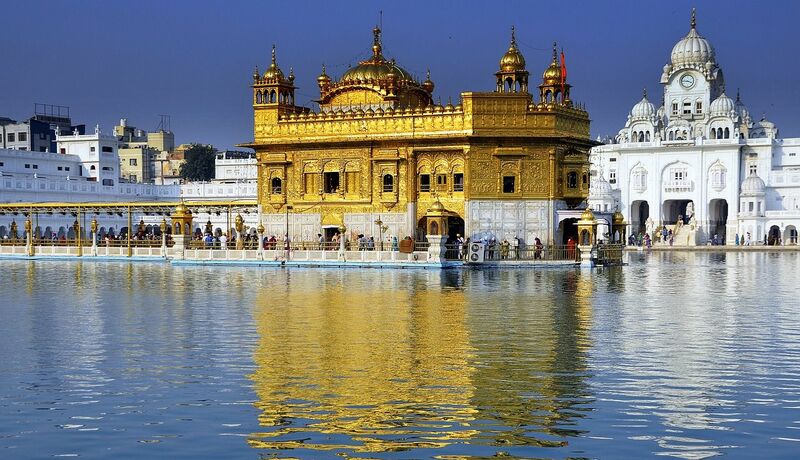 Inside, the temple looks divine surrounded by Amrit Sarovar, the pool from which the city gets its name Amritsar. The atmosphere is spiritual and the kada prasad you get after darshan is yummy. The place is so clean it should be the hallmark for Swacch Bharat Mission. You should plan to visit Golden temple twice. Once at morning and once at evening to see the lights. But if you are short on time, I recommend you go in the evening and stay till night. That’s what we did. However, such was the ambiance that I decided to find the time and go next day as well. Avoid weekends, which took us an hour on Friday to visit the inside of the temple, took devotees 3 hours on Saturday. While I don’t wish to divulge too much detail about the place, so that you experience it from your eyes open and mind unprejudiced. The truth is that I will always fall short of words on the experience that Durbar Sahib is. You would know that one needs to keep their head covered in gurudwara. While they offer a bandana, I was carrying a scarf but it would keep slipping. At one such moment, when I was unaware, someone passing by said to me, ‘Cover your head.’He didn’t look at me, just breeze passed. All I heard was his words. I will be frank. Though I quickly covered my head, I was a bit startled at his blunt way. But after getting a grasp of what happened, I actually didn’t mind. Being brought up in Hindu culture, you learn to accept different practices and ways of worship. As Swami Vivekanand said in his historic speech at Chicago: ‘As the different streams having their sources in different places, all mingle their water in the sea. So O Lord, the different paths which people take through different tendencies, various though they appear, crooked or straight, all lead to Thee.' The same small temple in the house would have Lord Ganesh, Krishna’s child form i.e. Ladoo Gopal, Maa Durga and a fakir Sai Baba. As a child, I remember my grandfather had a whole room dedicated to prayer. There was a huge line up of Gods in it. You could literally pick your favorite. However, while I believe in respecting all ways of worship. I also believe in freedom of exercising personal belief. We also tasted the langar at the temple. It was simple yet delicious. Management schools can certainly take a leaf out of this one of the largest, 24-7 functioning free kitchen of the world. After dinner, the next stop was Jalebiwala chowk for some mouth-watering jalebis to end the day, high on sugar. We started our next day with a heartful breakfast of pure ghee chole-puri at Kanha Sweets. It’s a small shop located on Lawrence Road with a restaurant in the backyard. We also tried their halwa but had to miss on chocolate burf as we wanted to keep some space for the yummy frozen fruit cream at Novelty. It’s a huge unmissable shop which is a perfect choice if you wish to take some North Indian sweets on your return. Next, we headed to the Partition Museum. It is again situated near the golden temple and has been made in the erstwhile British era Townhall. The museum is artistically and modernly designed with lots of unknown facts and treasures from the time of partition. It’s a must go place but do take some time in hand. Say at least 2 hours. We missed on parts of it as we had to leave for War Museum on our way to Attari Border or as popular known Wagah Border. Frankly, I was a little disappointed to know that Indian side Border is actually called Attari, not Wagah! But like Shakespeare said whats in the name. On our way, We also picked up lassi from Giani Di lassi, another popular joint in Amritsar. But there are two of these adjacent shops with similar names. We were in a car when the other Giani di lassi boy came and took the order. Since I am one of those who likes to tick off things I planned, I was a little disappointed. However, the lassi was decent, but I would still give Lassi of Kesar Da Dhaba 10 on 10 points. Before I speak about the phenomenon beating retreat is at the border, let's talk about the war museum. I would say, do plan to visit. It encompasses history and interesting facts about first Sikh guru to recent wars fought by our armed forces. The only downside is that it's a lot of written words as compared to visuals. So if you are a history buff you need to take extra time in hand. We rushed through later parts of the museum but did manage to experience a time pass 4D show there. Kids would enjoy the 4D experience. If Punjab Government is listening, the museum can be improved significantly. Especially the heavy on text part. You got to demand more from the consultants, aren’t they supposed to be the high paid and well-traveled kind? But still, do visit the museum. It's effortlessly on the way to border. No detour required. Talking about the border, you have to go there. It might be one of the closest borders to a city. The roads are well maintained, taxis are plenty and the beating retreat ceremony is memorable. But caution, if you don’t plan your trip, be ready for a long queue. While the experience in the crowd isn’t bad either, rebooking your pass with BSF can really save you the mess. So find a friend or friend of a friend who knows someone in BSF. Patriotism runs high during and before the ceremony. The anchor also ensures the audience is engaged, be it sloganeering, dancing or inviting people to run in circles with the national flag. I also went down the stands for a small jig and revel in the collective spirit. I have never met a Pakistani and so I was naturally curious. When we were sitting before the ceremony, a woman was crossing the border to Indian side with her luggage. She looked elitist and straight from Pakistani tv serials. The crowd in general on the other side was thin. The official ceremony is somber and disciplined. You can’t miss the professionalism and skillful demonstration of the physical strength of Indian officers. And why are they all so handsome? I guess its true for men from forces in general. The beating retreat on Indian side was definitely a notch higher than the other side. You would say that I am biased. And I wouldn’t say otherwise. We ended our day with one more visit to Golden temple and Kesar Da Dhaba for Dinner. The next day was our day of the flight. So we started our day with crispy kulchas of Bhai Kulwant Singh Kulchian Wala, a small shop tucked in one of the lanes near Golden Temple. There are several such shops in that area, but we tried this one and can certainly vouch for it. You have to try Kulcha in Amritsar. It's exceedingly crispy, laced with butter and crushed by both hands in front of you before served. We had allocated rest of the day for shopping. We headed to Katra Jaimal Singh, all ready to haggle for the price, following the golden rule of not buying from the very first place. Phulkari, the native handwork of Punjab, is unique and beautiful. The vivid colors of dupattas adorn the shops, leaving you spoiled for choices. Read more about this eco-friendly trip here. With one last shot of lassi in our stomachs and colorful memories on our mind, we left for the airport. Accommodation: Get a hotel near Golden temple as most of the places are in proximity. What we didn’t cover: Pul Kanjari is another historical place which you can club along with the border trip. What not to eat: The kulfi around Golden temple. The vendors will thrust it in your hands but don’t buy. It's a cheap and watery version of kulfi. If you have enjoyed my writings, don't miss this most popular article. I am a writer by passion, a petroleum engineer by accident and a proud Indian by origin. Follow my stories on Facebook, Twitter, and Instagram! Are We Scapegoats Of Consumerism? Being A Girl In The 21st Century Bharat! 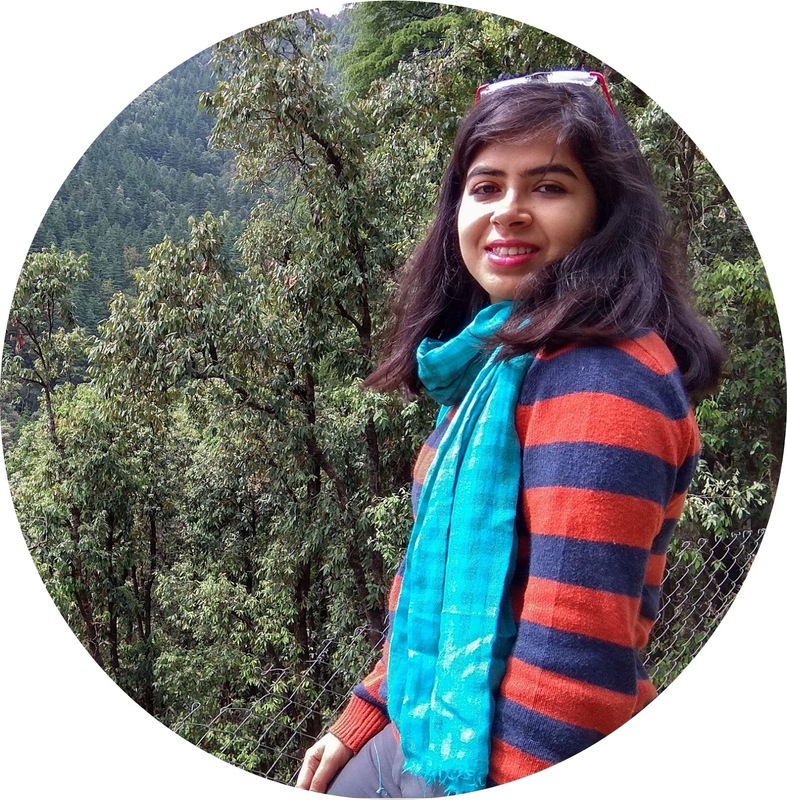 I am a writer by passion, a petroleum engineer by accident and a proud Indian by origin.